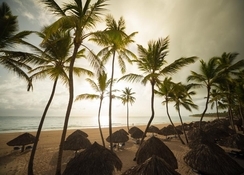 Nestled amid palm groves on one of the most beautiful beaches in the Dominican Republic, the four-star Tropical Princess Beach Resort & Spa is a vacationer’s paradise. The resort is a part of the large Princess complex and shares most of its facilities with the Caribe Club Princess – this hotel’s twin sibling. The 310 spacious rooms and suites are well equipped with all modern amenities and can accommodate families of various sizes. 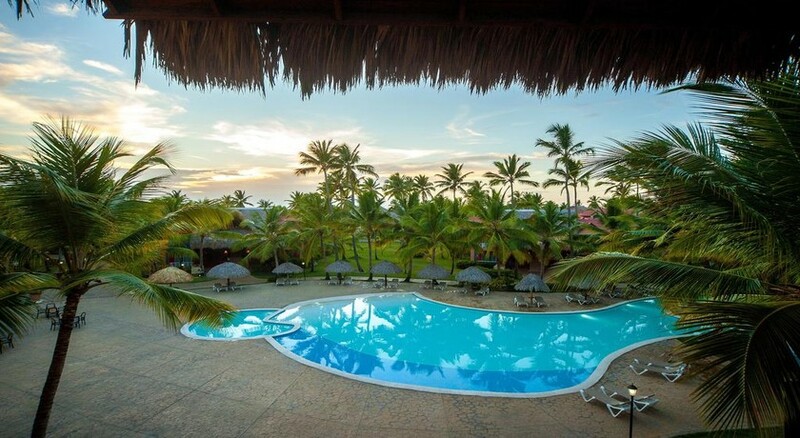 Apart from the picture-perfect Bavaro Beach right at the doorstep, the hotel boasts beautiful lagoon-like swimming pools for both adults and kids, a choice of 5 restaurants and 3 bars, tennis court, spa, disco and on-site casino. Outdoorsy travellers can engage in exhilarating water sports and outdoor activities, while young guests can enjoy at the kids’ and teens’ clubs. Points of interest like the Bavaro Beach and the Dolphin Island, as well as the various other destinations, are all within easy reach of the hotel. 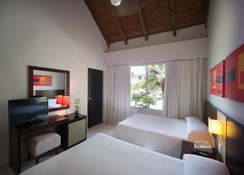 Tropical Princess Beach Resort & Spa is located on the Bavaro Beach in the province of Altagracia in the Dominican Republic and is 7 minutes’ walk from the white sands. Set on the Caribbean coast, it enjoys easy access to many of the local area’s points of interest. The resort is set 3 minutes’ walk from Arena Blanca Beach while the San Juan Shopping Centre is 15 minutes’ drive away. Various other entertainment venues are located at only a 20-minute walk from the hotel and the Punta Cana International Airport is a 30-minute drive away. 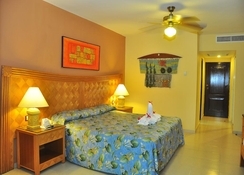 Decorated in a Caribbean style, the 310 guest rooms of the Tropical Princess Beach Resort & Spa are split between 164 superior rooms (sleeps up to 4 people) and 146 family suites (sleeps up to 6 people), all of which have independent air-conditioning and climate control. The comfortable rooms comprise of en-suite bathroom with toiletries, hairdryer and bathtub or shower, a direct dial telephone, satellite/ cable TV, a minibar/ fridge, safe and rollaway extra beds. The rooms open onto a terrace or balcony that overlooks the enigmatic pool or garden views. Additionally, the hotel also provides daily housekeeping as well as a turndown service on request. For food and beverage, the Tropical Princess Beach Resort & Spa provides a choice of 5 restaurants, 3 bars and a snack bar on the beach that offer a variety of cuisines and drinks. All the restaurants are adapted for families, with child seats available for the tiny tots. The Higuero Restaurant overlooks the garden and serves international cuisine in buffet style, while El Rodizio overlooks the pool and garden and offers Brazilian cuisine. The third in the list is a themed restaurant, El Pilon, which specialises in local cuisines and serves dinner only. Guests can also dine at La Cava and El Pescador restaurants belonging to the neighbouring Hotel Caribe Princess. Apart from the restaurants, the resort treats the guests with a choice of 3 bars that serve national and international drinks, snack bar La Matica and Le Creperie Café that specialises in crepes. 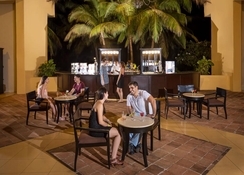 There are also 4 bars at Hotel Caribe Princess completely accessible to the guests here. The resort not only offers an outdoor complex with 2 swimming pools to relax by but also attempts to take the experience to the next level with a huge range of added facilities. 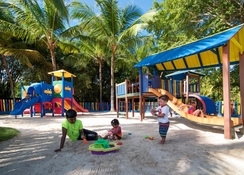 For its young guests, the resort has a children’s club, a paddling area and a teens’ club, while sporty adults can engage in tennis, table tennis, beach volleyball, archery, billiards and basketball. There are also daytime activities on the beach and pool. As an added advantage, guests can enjoy non-motorized water sports on payment of extra fees. Apart from the activities, the resort offers evening entertainment, discotheque, nightclub, gym and sauna. Guests can try their luck at the Avalon casino at Bávaro Princess, with free shuttle service provided. Offering some more choices to relax and enjoy, the resort lies 15 minutes away from the very happening San Juan Shopping Centre. Children between the age of 0-2 years are allowed free while those aged between 3 -12 years are charged 50%.